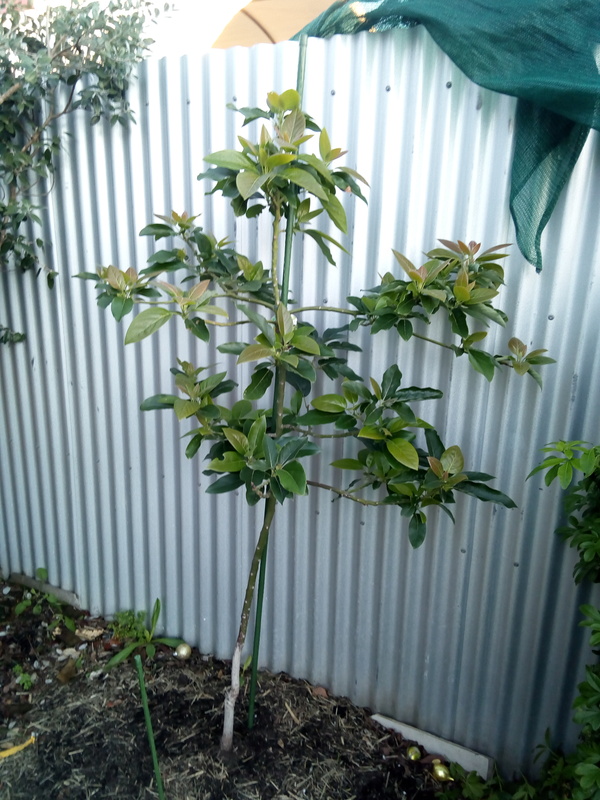 I am a horticulture student who grows tropical fruit trees in Central Victoria. I put in lots of effort to try and beat the odds of the climate against me! I have learned from many mistakes, and I am still learning; but with more and more success. I hope you can use some of the advice I have given about the plants. I also write the music for Daley's Videos. 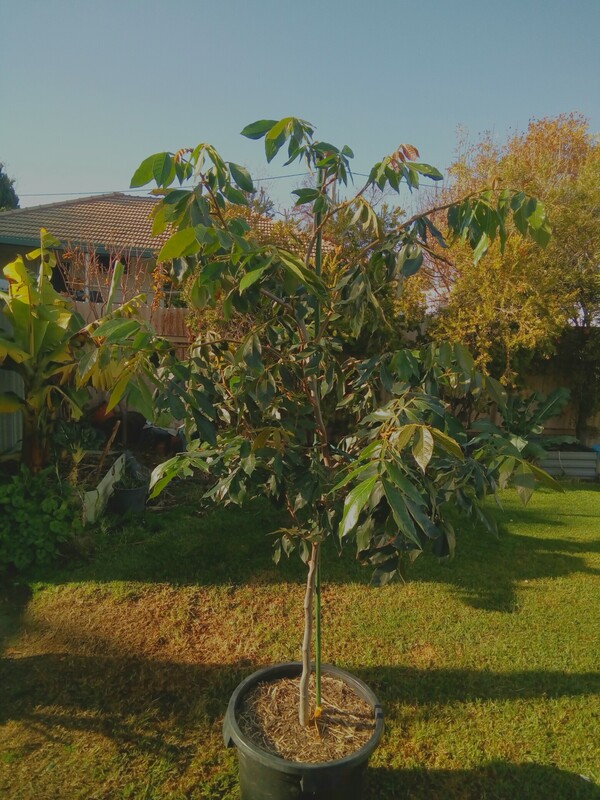 Tropical Fruit Trees in Victoria need to be kept and maintained in pots. That's just the way it is. It's the only way to monitor the health and provide appropriate conditions in order to keep them healthy and eventually get fruit of decent quality. Will update everything after Summer has ended. Comments: - Arrived looking stunning; complete with flowers. Looking forward to seing if it fruits. Comments: - Died back but then re-grew. Had yo prune off at least 5 leaders to leave a single leader. Doing nicely now and growing strong. Comments: - Coffee is life! 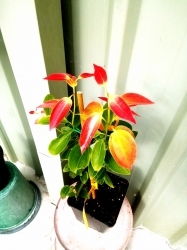 Great sub tropical plant and a good choice for experienced gardeners in temperate zones. 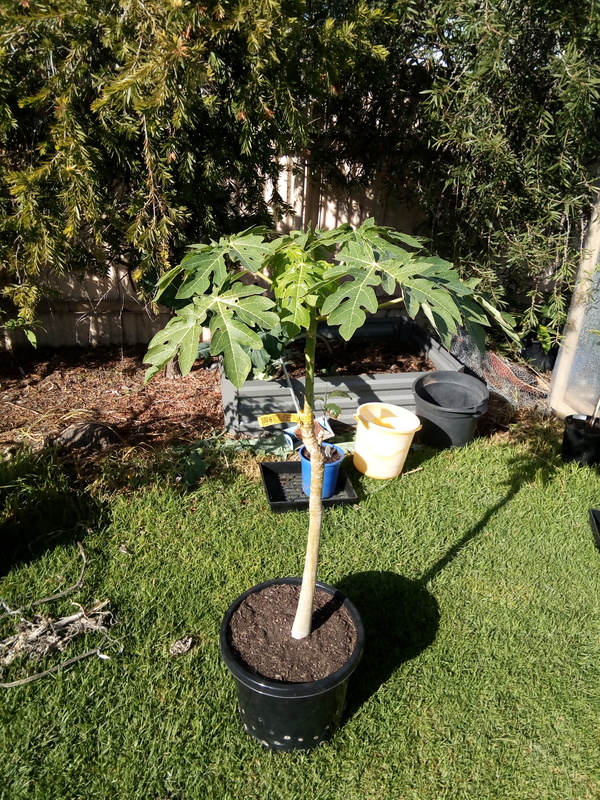 After growing in a pot for a year, I moved it into the ground. It's doing well. 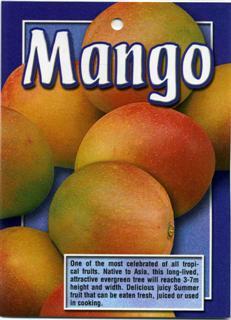 It fruited the first year, but the fruits fell off before they could grow to maturity. That's expected though. I keep a shade cloth to protect it from harsh sun and winter dew. This is the best variety of Avo for beginners in temperate regions. 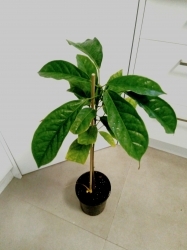 Comments: - Awesome tropical plant with a great aesthetic quality. Beautiful foliage. 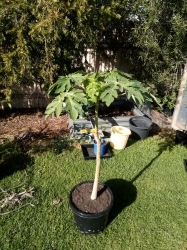 Comments: - Re-potted as soon as it arrived and began growing nicely after a few days. 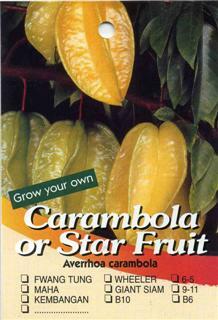 The Carambola's foliage will fold up at night to protect itself. Loves a good does of sun. The only problems I've faced with this plant are pests. Keep a watchful eye; the nasties will turn up very unexpectedly. 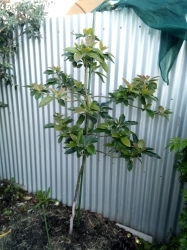 Seems to cope surprisignly well in the temperate climate; even pushing out new growth through the winter. I squired some black sapotes about 3 weeks ago. How are yours doing in terms of growth/health? The buds on mine have turned yellow and swollen, some turned brown. I Keep them in an unheated garage at night and bring out during the day. Thanks for your reply. 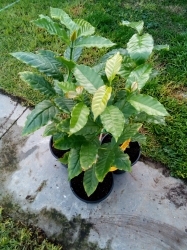 I am in VIC (south eastern suburbs) Initially i was hoping to get some at the start of spring but the seller was selling them quick and its rare to find 2 year old advanced seedlings for the cheap price so i had to buy them quick. so far out of the 4 plants (they sent me 2 extra) only 1 has lost 2 leaves. How is the Rolinia doing? 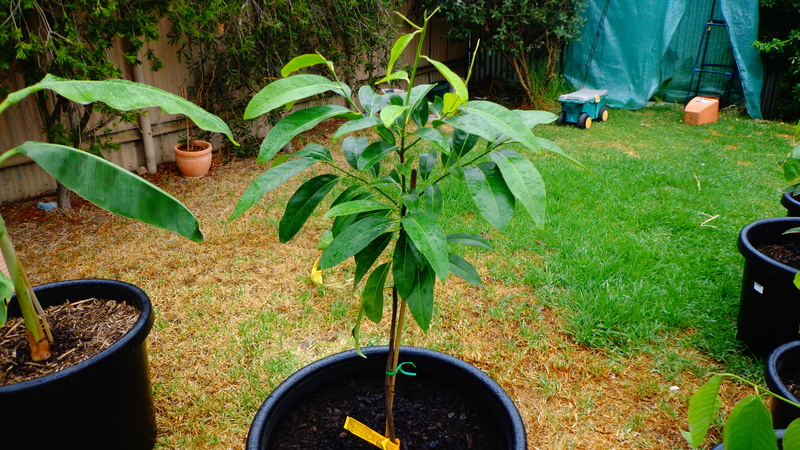 im thinking of getting either that or a custard apple seedling. cheers. Really sorry for the late reply!! Yeah, I have found that once the Sapote got going; it was fine. 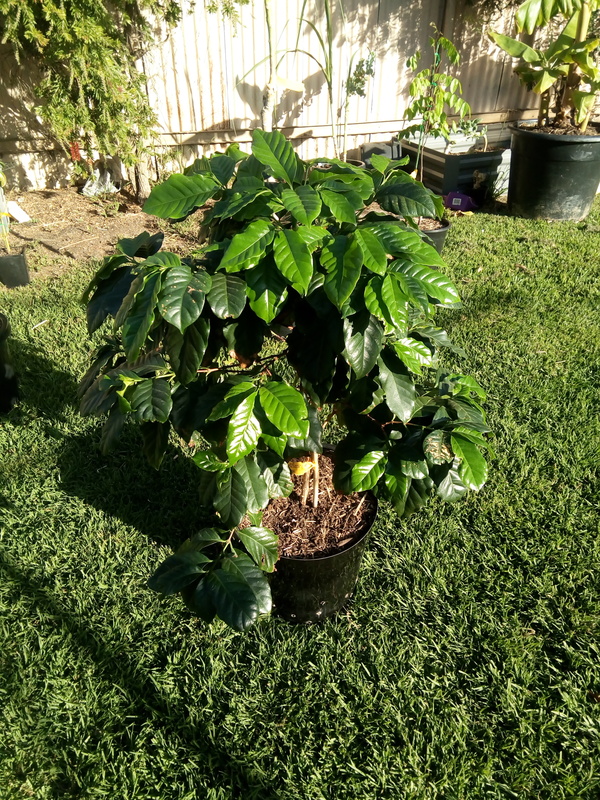 If yours are still producing growth through this winter like mine, it will be ready for the warmer months. Make sure it gets filtered sunlight in the really hot months of summer though; no direct hot burning sun. As for the Rollinia, I initially lost one to in-experienced mistakes. But they are really tricky to keep alive down here. They definitely need light no matter what. Mine is surviving from artificial lighting from lamps and the occasional sunny day outside. 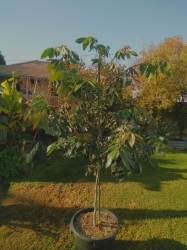 The Rollinia I have is the Brazilian Custard Apple from here at Daley's. It produces new growth but doesn't have the right conditions to be healthy enough to maintain all of it; so some (not all) of the new shoots eventually die. But the plant itself is alive and still trying; so that's the main thing :) . I would hold off until spring before getting one; that way it can get nice sun but slowly adjust from cooler weather to warmer weather. Then when winter comes, you can nurse it with a warm room and some lighting on it. Make sure you get the soil conditions right so you don't have to mess with or change the soil as they hate having their roots disturbed. No worries. 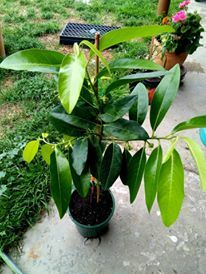 My black sapotes and my white sapote are trying to push new growth as well but lack of direct light and heat impede their progress and are not showing signs of dying at all. Overall im impressed with their resilience. Good luck to your collection of trees! Such a beautiful tree. A Perfect addition to a tropical garden. Very hard to grow in VIC; but that's the point! A good challenge with wonderful rewards. This is mainly advice for any Victorian growers; not really for you lucky people in QLD! Of course the Cacao has a strict climate zone in which it can grow freely. However, I have seen them growing quite well on Magnetic Island. Further north, there is a plantation at Mission Beach; which is still just outside of the required climate zone. Given the right care, they can be grown just outside this climate zone (I think it's 15 degrees North & South of the Equator). That's in the ground though; in VIC, they must be kept in pots! LOVES RAIN!!! Whenever it rains, make sure it gets as much as possible. Hates wind: the leaves will break at the the stem. Water them pretty regularly, especially in summer. A big drink each time might be getting carried away, but definitely small drinks. I do this to try and replicate a short sudden down pour that it would normally receive in the amazon/tropics. Plus, this also keeps the soil moist. Remember: Cacao plantations utilise Banana trees as a canopy, so you should try and replicate this in some way. Therefore, Cacao does not like hot direct sunlight: this will kill them. Do not put out in the full sun. You can slowly adjust them to the sun as they mature in NQ - but even still, a 'sunscreen' coating is usually sprayed onto the leaves to protect the plant from the sun. But really not not a good idea in VIC as the UVs are too intense - particularly in the central and north west. Well-filtered sunlight through a thick canopy such as Bananas (very unlikely in VIC, I know! - Yes! We have no Bananas!) or the canvas from a green house will do the trick. Thick shade cloth will also do the trick. They do well in a greenhouse that is nice and humid, but beware of letting the 'sauna' turn into an oven! Make sure you spray plenty of water in the greenhouse to let the heat creat humidity. Use a hot house that does not have a clear plastic cover: get one with a green/shaded cover to stop the brightness and extreme heat. Another technique that I use is to actually drape a shade cloth over the greenhouse. This will definitely stop any un-wanted excess heat or direct sunlight. Although they love heat, you still have to be carefull, because I have seen them suffer from heat exhaustion before. A lack of water and humidty will cause this to happen. FOR WINTER: Keep them in a warm room. Try to avoid heaters blowing hot air. I use one of those oil filter things. Here's the thing: The room will eventually become too dry and the Cacao plants will not like it. So make sure you mist the leaves with a gentle spray. This will keep up some huimidity around the plant and it seems to do the job pretty well! Mist around the rim of the container too so that the water evapoates through the leaves. TIP: Some people avoid using black plastic pots. But I prefer them because they attract more heat and warm up the soil for the tropicals in VIC. 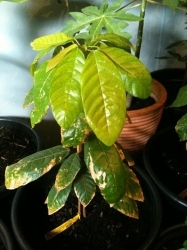 Cacao grows well indoors; providing that they get some sort of natural, outside light whenever possible. That's why having a thick shade cloth is good. Remember, do not allow any wind to attack the Cacaos! Keep soil moist but not soaking; particularly if the soil is not super well draining. occasional Thrive does well for improving growth - along with other highly diluted fertilizers, and eco-oil will keep the pests off. Do not let the soil completely dry out as this will kill them also. Don't over-fertilise. The leaves will blacken and die as they grow. Thrive is safter most of the time. 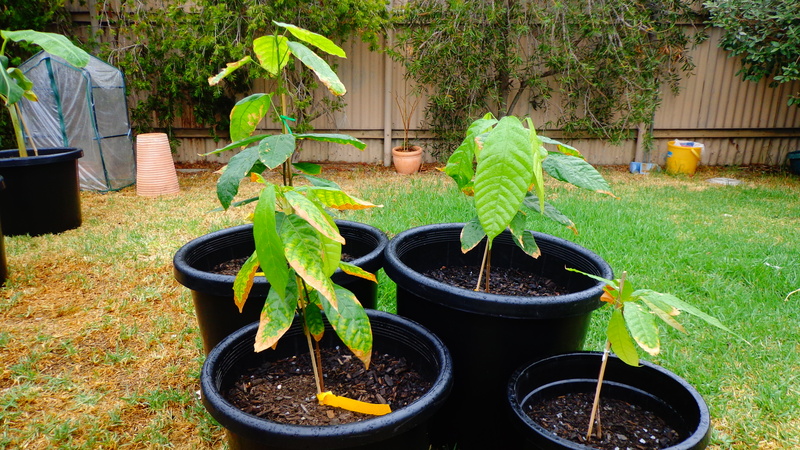 I've found that even when the nights are warm in summer, the Cacao plants still like a nice, still (no wind) place to stay. I keep them in a room where the temperature is still warm to mild from the hot day, but slightly warmer than the outside temperature; and there is no wind.